The Digital Learning and Technology Team provides leadership, service, and advocacy for equitable access to and effective use of information, resources, and instructional technology in Wisconsin PK-12 schools to ensure successful lifelong learning. The Digital Learning and Technology Team provides information and support to district administrators, educators, legislators, public interest groups, strategic partners, professional organizations, researchers, and media. 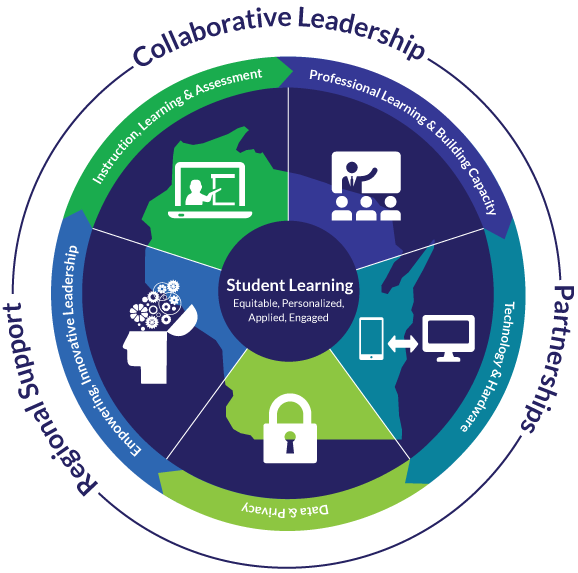 DPI has introduced new tools for districts to use to develop Digital Learning Action Plans (elements of technology plans), built around Wisconsin's Digital Learning Plan and the nationally recognized Future Ready Framework. You can use these planning "power tools" to help you identify concrete steps that your district can take to build digital learning into your curriculum. The introduction to new information, the exchange of questions and answers, and the provision of other technical assistance by the DPI Digital Learning Team will continue to evolve as resources for planning, instructional support, policy updates, and financial programs for funding digital learning are created. Below you will find links to sites and social media accounts used by the DPI Digital Learning Team to share information and resources.